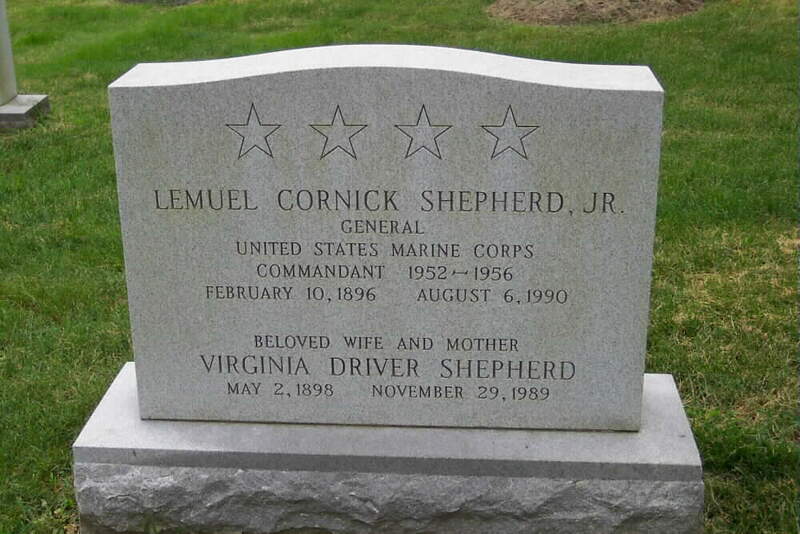 On 1 October 1959, General Lemuel C. Shepherd, Jr., United States Marine Corps, retired from active duty after forty-two years and six months distinguished service to his Corps and country. Born on February 10, 1896, in Norfolk, Virginia, General Shepherd is a graduate of the Virginia Military Institute. He was commissioned a second lieutenant in the Marine Corps on April 11, 1917, and, on May 19, reported for active duty at the Marine Barracks, Port Royal, South Carolina. Less than a month later, Lieutenant Shepherd sailed for France as a member of the 5th Marine Regiment, with the first elements of the American Expeditionary Forces. He served in defensive sectors in the vicinity of Verdun and participated in the Aisne-Marne offensive (Chateau-Thierry) where he was twice wounded in action at Belleau Wood during the fighting there in June of 1918. Upon returning to the front in August, he rejoined the 5th Marines and saw action in the St. Mihiel and Meuse-Argonne (Champagne) offensive where he was wounded for the third time. For his gallantry in action at Belleau Wood, Lieutenant Shepherd was awarded the Army Distinguished Service Cross, the Navy Cross, the French Croix de Guerre, and was cited in the general orders of the 2d Infantry Division, American Expeditionary Forces. After duty with the Army of Occupation in Germany, Captain Shepherd sailed for home in July 1919. In September, he returned to France for duty in connection with the preparation of relief maps of the battlefields over which the 4th Brigade of Marines had fought. Upon Captain Shepherd's return to the U. S. in December 1920, he was assigned as Aide-de-Camp to the Commandant and Aide at the White House. In July 1922 he was assigned duty in command of a selected company of Marines at the Brazilian Exposition at Rio de Janeiro. In June of 1923, Captain Shepherd was ordered to sea duty as Commanding Officer of the Marine Detachment, USS IDAHO. This tour was followed by duty at the Marine Barracks, Norfolk, Virginia, where he commanded the Sea School. In April 1927, Captain Shepherd sailed for expeditionary duty in China, where he served in the 3d Marine Brigade in Tientsin and Shanghai. Upon returning to the United States in 1929, he attended the Field Officers' Course, Marine Corps Schools. After graduation, Captain Shepherd was assigned overseas again, this time on detached duty with the Garde d'Haiti where he served for four years as a District and Department Commander. Following the withdrawal of Marines from Haiti in 1934, Major Shepherd was detailed to the Marine Barracks, Washington, D. C., as Executive Officer and as Registrar of the Marine Corps Institute. Promoted to Lieutenant Colonel in 1936, he was assigned to the Naval War College at Newport, Rhode Island. Following graduation in May 1937, he commanded the 2nd Battalion, 5th Marine Regiment, part of the newly formed Fleet Marine Force, Atlantic, which was being extensively employed in the development of amphibious tactics and techniques. In June 1939, he was ordered to the Staff of the Marine Corps Schools, Quantico, Virginia, where he served during the next three years as Director, Correspondence School; Chief of the Tactical Section; Officer in Charge of the Candidates Class, and Assistant Commandant. In March 1942, four months after this country's entry into World War II, Colonel Shepherd was ordered to command the 9th Marine Regiment. He organized, trained, and took this unit overseas as part of the 3d Marine Division. 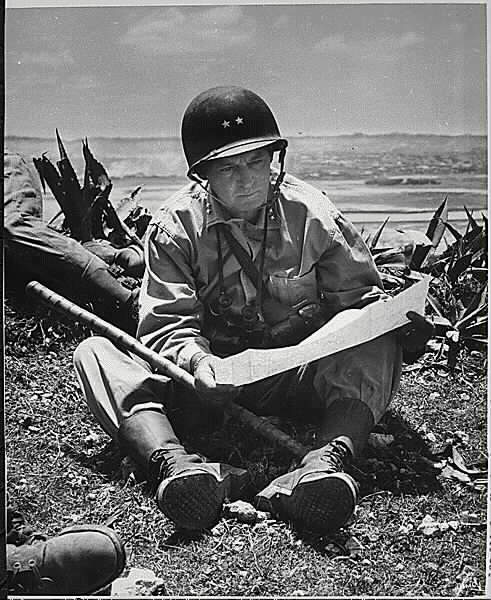 Upon appointment to flag rank in July 1943, while serving on Guadalcanal, Brigadier General Shepherd was assigned as Assistant Division Commander of the 1st Marine Division. In this capacity, he participated in the Cape Gloucester operation on New Britain from December 1943 through March 1944, where he was awarded a Legion of Merit for distinguished service in command of the Operations in the Borgan Bay area. In May 1944, General Shepherd assumed command of the 1st Provisional Marine Brigade and led this organization in the invasion and subsequent recapture of Guam during July and August of 1944. For distinguished leadership in this operation, the General received his first Distinguished Service Medal, and was promoted to Major General. 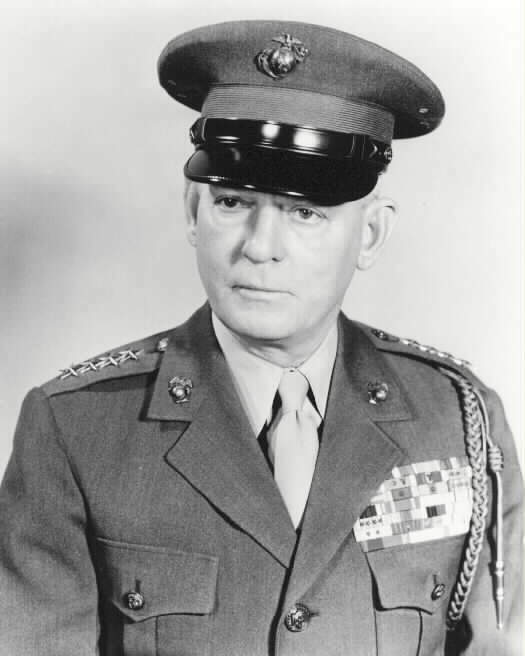 After organizing the 6th Marine Division from the Brigade, Major General Shepherd commanded it throughout the Okinawa Operation and subsequently took the Division to Tsingtao, China. There, on October 25, 1945, he received the surrender of the Japanese forces in this area. For exceptionally meritorious service as Commanding General of the 6th Marine Division in the assault and occupation of Okinawa (1 April to 21 June 1945) he was awarded a Gold Star in lieu of a second Distinguished Service Medal. The citation for this decoration reads in part: "Schooled by grim experience in the art of countering Japanese strategies, Major General Shepherd organized a major Marine Corps fighting unit for the second time within a year, planned its commitment into battle with brilliant military acumen...and demonstrated a superior ability to use the men and weapons at his command. His indomitable courage and astute judgment were important factors in the success of his division's operations." Several months later, the General returned to the United States and in March 1946, organized the Troop Training Command, Amphibious Forces, Atlantic Fleet, at Little Creek, Virginia. On November 1 of the same year, he was ordered to duty as Assistant to the Commandant and Chief of Staff of Marine Corps Headquarters. He remained at this post until April 1948, when he was assigned to Quantico, Virginia, where he served as Commandant of the Marine Corps Schools until June, 1950. 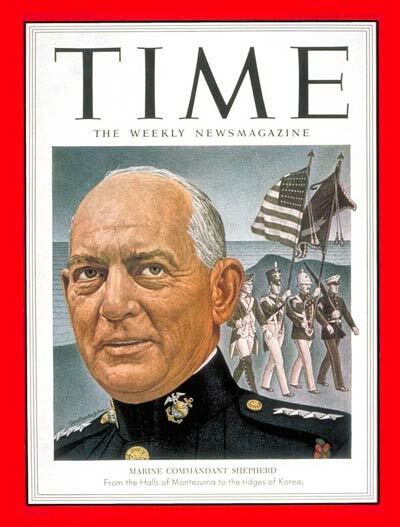 When the Korean War erupted, General Shepherd was in command of the Fleet Marine Force, Pacific, with Headquarters at Pearl Harbor. In this capacity, he participated in the landing at Inchon and the evacuation of our forces from Hungnam following the withdrawal from the Chosin Reservoir in North Korea in December 1950. On 1 January 1952, he was appointed the twentieth Commandant of the Marine Corps by the President of the United States. During General Shepherd's four year appointment as the 20th Commandant of the Marine Corps he initiated a number of important policies which resulted in an increased military proficiency of the Corps. He was the first Commandant to become a member of the Joint Chiefs of Staff, and upon his retirement on 1 January 1956, he was awarded a third Distinguished Service Medal. President Eisenhower's citation read in part: "His farsighted understanding of our national objectives, dedicated as they are to the establishment of enduring peace throughout the world, has likewise earned him the keen regard of the most important policy making organizations of this country. This distinguished officer's contribution to the Government of the United States during 39 years of unfaltering devotion in both war and peace, reflects the highest credit upon himself and the United States Naval Service." Two months after his retirement, General Shepherd was recalled to active duty and appointed Chairman of the Inter-American Defense Board. During the three and a half years of service with this international organization, General Shepherd by his leadership and diplomacy, made substantial contributions towards plans for the defense of the continent and the promotion of military solidarity among the military forces of the Republics of this Hemisphere. Upon the relinquishment of his duties with the Inter-American Defense Board on 15 September 1959, General Shepherd received a commendatory letter from the Joint Chiefs of Staff which reads in part as follows: "During a period of many world tensions, your dynamic leadership has imparted new vigor to the Inter-American Defense Board. The record lists numerous tangible accomplishments reflecting your superb attainments. Furthermore, there have been splendid achievements of an intangible nature, far-reaching in promoting hemispheric solidarity. As a result of your continuing efforts, the Inter-American Defense Board has maintained a stature unequaled in its history and has become a positive factor in the destiny of the Western Hemisphere. In addition to the Navy Cross; Distinguished Service Cross; Distinguished Service Medal with two Gold Stars and the Legion of Merit with Oak Leaf Cluster; his decorations and medals include the Silver Star with two Oak Leaf Clusters, France 1918 and Korea 1950; Oak Leaf Cluster in lieu of a second Legion of Merit, China 1945; Bronze Star, China 1945; Purple Heart with two Oak Leaf Clusters, France 1918 and one Gold Star, Okinawa; Presidential Unit Citation with three Bronze Stars, Okinawa and Korea; Navy Unit Commendation with one Bronze Star, Guam and Cape Gloucester; Victory Medal World War I with four Bronze Stars, Aisne-Marne, St. Mihiel, Meuse-Argonne, and Defensive Sector Clasp, France 1918; Expeditionary Medal with one Bronze Star, China 1927-28, Haiti 1930; Yangtze Service Medal, Shanghai, China, 1927; American Defense Service Medal; American Campaign Medal; Asiatic-Pacific Campaign Medal with four Bronze Stars; China Service Medal, 1945; Victory Medal World War II; Navy Occupation Service Medal, 1945; National Defense Service Medal; Korean Service Medal with two Bronze Stars; United Nations Service Medal; French Croix de Guerre with Gilt Star, France 1918; French Fourragere, France 1918; Medaille pour la Bravoure Militaire (Montenegrin) with crossed swords and palm; Haitian Order of Honor and Merit; Haitian Distinguished Service Medal; Order of the Cloud and Banner, Second Grade, China; Republic of Korea Order of Military Merit Taiguk Medal with Gold Star; Korean Presidential Unit Citation; Bronze Plaque with Diploma Commemorative Especial, Brazil 1922-23; Naval Order of Merit, Grand Officer Argentine 1955; Naval Order of Merit, Grand Officer Brazil 1955; Grand Cross of Naval Merit of Spain 1955; Abdon Calderon, First Class, Republic of Ecuador 1956; Military Order of the Ayacucho, Grand Officer, Peru 1956; Grand Cross, National Order of Merit of Paraguay 1956; Military Medal of the Army, First Class, Chile, 1956; Medal of Military Merit of Mexico, First Class 1956; Legion of Honor, Grade of Commander, France 1957; Brazilian Order of Military Merit, Degree of Grand Officer, 1959; Commander of the Order of Couronne, Belgium, 1959; National Order of Military Merit of Paraguay, Grade of Grand Officer, 1959. The Navy Cross is awarded to Captain Lemuel C. Shepherd, United States Marine Corps. On June 3, 1918, near the Lucy-Torcy Roads Captain Shepherd declined medical treatment after being wounded and continued courageously to lead his men. 5th Regiment (Marines), 2d Division, A.E.F. The Distinguished Service Cross is presented to Lemuel C. Shepherd, First Lieutenant, U.S. Marine Corps, for extraordinary heroism in action on June 3, 1918, near the Lucy-Torcy Roads, France. First Lieutenant Shepherd declined medical treatment after being wounded and continued courageously to lead his men. He died on August 6, 1990 and was buried in Section 7 of Arlington National Cemetery. His wife, Virginia Tunstall Driver Shepherd (May 2, 1898-November 29, 1989), is buried with him.